A day diving for lobsters turn into a frantic rescue mission at Beacon's Beach near San Diego. I'm asking for a helicopter. We need to airlift someone out for a shark attack. Help came quickly. Emergency responders trying to save a 13-year-old boy, airlifting him to the hospital. We heard this kid scream. Chad Hamel kayaking nearby helped the team get away. I started paddling towards him when there's a big old, you know, wake of blood behind him. The boy's wounds showing the big bite on his body, ripped open everything in the back and then the top teeth came down and got his cheek. 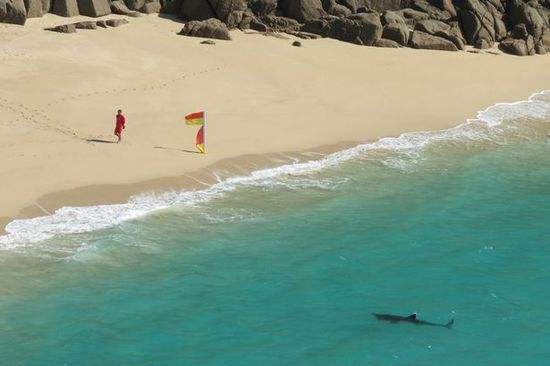 Authorities say the shark was about 11 feet long. It's a latest at a number of shark attacks from coast to coast. One incident near Cape Cod earlier this month turned deadly. This California beach now closed. Warning signs up have people seeking safety on the shore. The injured were airlifted to a hospital in Dayton. Go for a swim, try kayaking, or take a hike -- anything that will get you burning calories.